Hard drive and flash drive manufacturers are taxing your devices. It’s insidious and I think the public has a right to know the two ways your drive is being taxed! Ever notice that the size of a folder is sometimes smaller than the size it takes up on the disk? You can see the truth in this by looking at the properties of any file or folder. The reason is the size of your file chunks. See, a file is not stored right next to another file or even all the pieces of itself. It’s broken up into buckets of the same size. For big files the empty space in these buckets is small but for small files it can add up quick. These chunks can’t have pieces of two different files inside them, and the chunks must all be the same size. NTFS, the standard file system on Windows hard drives, has chunks of 4 kilobytes. Many programs have thousands of tiny files, storing settings and other data. 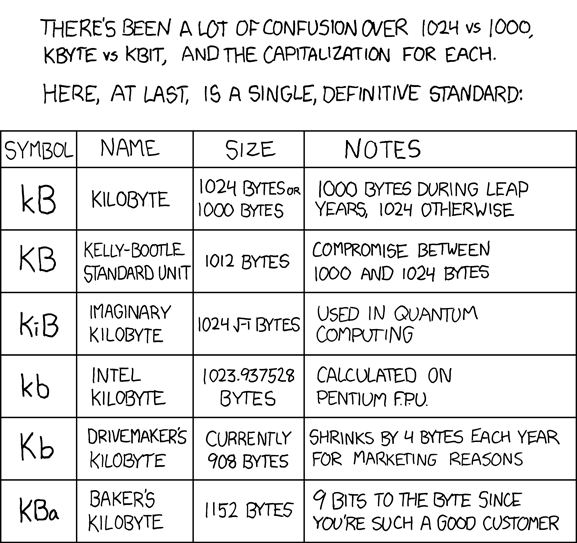 Let’s say we have 1024 one kilobyte files, or one megabyte. Since each file needs its own bucket, and the buckets are 4 kilobytes in size, our 1 megabyte of files takes up 4 times as much space. On flash drives there is even more wasteful storage spending, with chunk sizes of 16 or 32 kilobytes. Our 1 meg in files can take up as much as 32! (For CDs and DVDs this is not true since they use a file system that uses every bit of space). But that’s only one tax you have to pay. When you buy an 8 gigabyte flash drive what you get is only about 7.47 gigabytes. That’s a more than 6% tax! It gets even worse at higher capacities. I bought one 64Gb drive that was 59.5Gb and the same brand a month or so later and only got 57.5! That’s a 33% tax increase in a month, raising my rates to more than 10%! See drive makers aren’t using the engineering definition of a gigabyte. They’re selling you a GB not a Gb. A GB may be a 1000 megabytes instead of 1024, or even less. My own hard drive tax is 200Gb+. That’s 250 movies or 1000s of songs and pictures. However you vote this November, make sure they are willing to sign a pledge to stem the tide of the gigabyte tax. It hurts small businesses and digital hoarders everywhere. Who knew you could be so funny?? You Americans, so worried about such measly taxes.